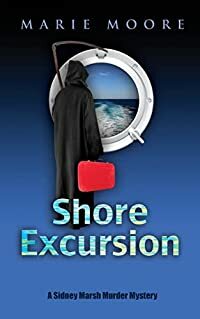 Shore Excursion by Marie Moore, a Mysterious Review. Review: Sidney Marsh, a Southern belle from Mississippi now working as a travel agent for the Itchy Feet Travel agency in New York City, finds herself on tour — and in trouble — in Shore Excursion, the first mystery in this series by Marie Moore. Her current assignment is as tour leader on the Rapture Cruise Line traveling from London to Scandinavia and then on to Russia. The group she is guiding consists mainly of fun-loving, if also aging, clients who call themselves the "High Steppers" … though there are a few others along as well. She is assisted by her business partner and friend Jay Wilson. All is going well until Ruth is found dead, strangled. The ship's doctor calls her death a suicide, but Sidney can't accept that finding. She knows that cruise companies will do just about anything to avoid bad publicity — and she believes they're covering up the true cause of death here — but as an industry representative she will have to be very careful not to step on anyone's toes if she decides to investigate on her own. And investigate she does when a stranger is killed during a shore excursion, an incident Sidney believes may be related to Ruth's murder. Anyone who has been on a cruise ship will appreciate the behind-the-scenes look at what goes on in Shore Excursion, murders notwithstanding. Sidney Marsh is an engaging amateur sleuth and the mystery in which she finds herself is creatively devised and vividly drawn. (The international setting helps as does a diverse cast of suspects.) Readers will certainly welcome back Sidney on another tour. Special thanks to guest reviewer Betty of The Betz Review for contributing her review of Shore Excursion. Acknowledgment: Camel Press provided a copy of Shore Excursion for this review.